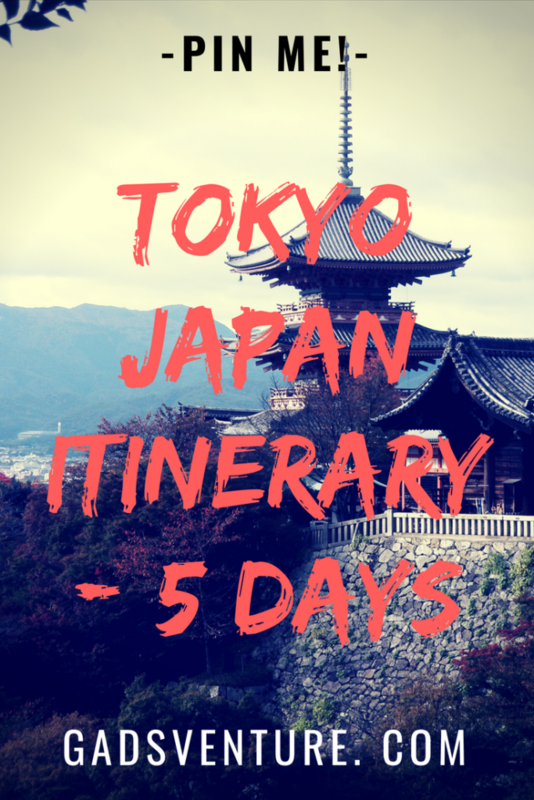 If you had 5 days to spend in Tokyo, what would you do? How many cool places will you see in this time? 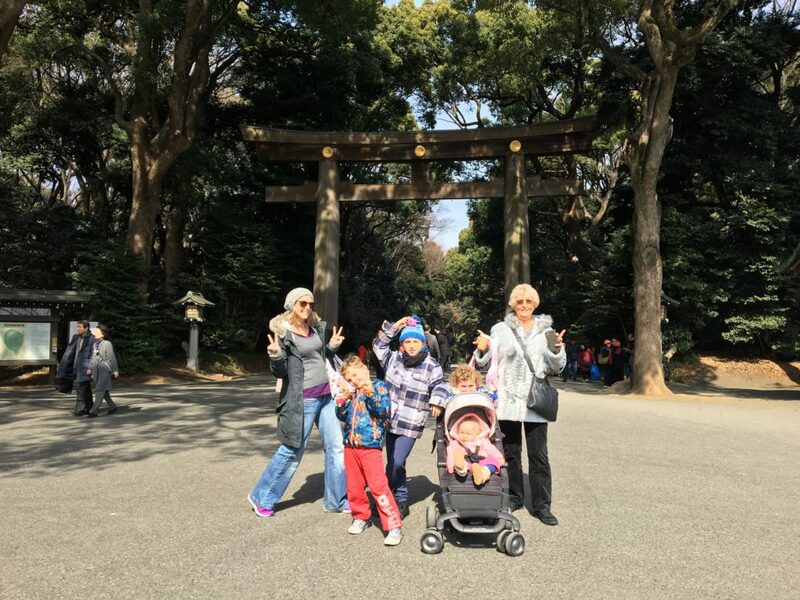 Here is a sample Japan Itinerary that we used when travelling to Japan with the kids. It was late February early March when we travelled so our 2 week trip had a snow focus as well. For our Tokyo Japan Itinerary, we decided to spend 5 days exploring the city using Shinjuku as our base. Now, you could easily stay in Tokyo for a whole 2 weeks there is that much to do! But we found 5 days ample time to have a great taste of this great city before we were ready to head into the Japanese Alps. And our itinerary does not cover all that Tokyo has to offer, by any means. You could jam pack it in a bit more, but thanks to the ages of our children, we could only push them so far. If you had more time, you could add the Fish Market, and the Imperial Palace, maybe Tokyo Tower and you could substitute Disney. We ended up deciding against Disney because we left it until day 5 and the weather turned bad. Perhaps you may need more than one day for Tokyo Disney too, but that is a different story. We have 4 kids aged 1, 5, 6 and 8. So, if you have looked around this site at all, you will find that most of our info relates to traveling with a family. This itinerary focusses on keeping the kids happy too! Read about our 2 week Japan Itinerary here. Our flight from Australia landed at Narita Airport around 8pm so by the time we caught the Narita Express train straight to Shinjuku and found our Airbnb, it was nearly midnight. Find out more about how to catch the Narita Express here. Why do we stay in Shinuku? Read more here. How do we rate Airbnb? Find out here. 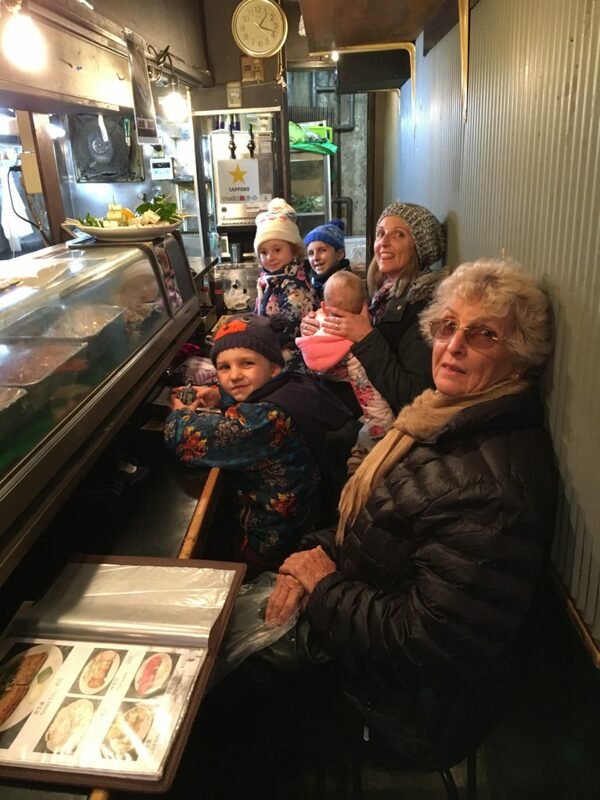 Once we had fed the kids and convinced them to go to sleep on day 1, we were then kept awake by an earth tremor in the middle of the night which gave us a little bit of anxiety. Also our apartment was close to a major hospital so we heard a few sirens in the night too. I don’t know if you have ever heard an ambulance in Tokyo but the siren is followed by some garbled, intense sounding Japanese on a loudspeaker. We had no idea what they were saying so coupled with the earth tremor, it was a bit of a sleepless night! Anyway, that being said, made us a little weary on day 2 so we thought the best plan would be to explore our local area, Shinjuku. 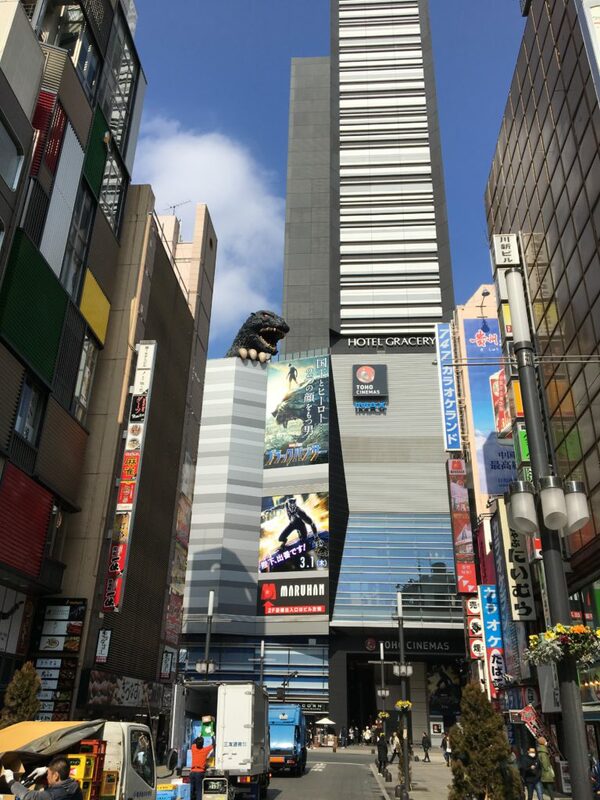 Shinjuku is home to some great attractions during the day, but the area really lights up and comes to life at night as well with a crazy neon wonderland so it is great to see at any time. We wandered around the main streets around Kabuchiko. Around 10am everything starts opening up and coming to life. To avoid crowds for anything in Tokyo, get there early and avoid weekends! With 3 kids and a baby in a stroller, this was our philosophy. 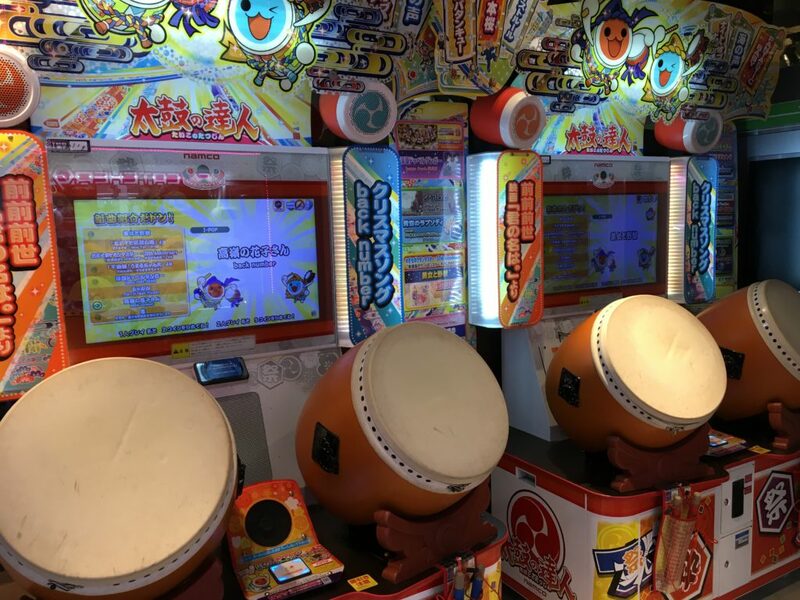 KaraokeKan – excellent tourist friendly karaoke booths! A must do experience, even if you have to share the microphone with the kids. Godzilla Head – at the top of the Gracery Hotel is a massive Godzilla head peering down to the street below. You can take the elevator up to the top floor of the Hotel and see it up close but you are supposed to buy something from the cafe there or the giftshop. It looks great from the street level too. See pay by the hour Love Hotels and Capsule Hotels. We wandered around the area and took it all in. The kids were excited, we were excited. We had some Ramen and Gyoza before making our way to the Gyoen Park to chill out and give the kids a run around. Next stop was the Tokyo Metropolitan Government Building for the best views from the 45th floor observation deck. It is FREE, and open from 9:30am to 11pm most days. They check your bags going in and it can be a long wait depending on the time of day. After walking around all day, we were all pretty knackered by this time but the stomach dropping ride up the elevator and the interactive robot up the top more than restored the kid’s energy and we spent over an hour up the top enjoying the view and the exhibits. Shinjuku is great during the day but gets even more action packed and fun after the sun goes down. Stroll around the streets for the best Neon Lights in the city. Check out the Robot Restaurant if you dare! Golden Gai for super cool and cosy alley ways full of tiny bars (best for when the kids have gone to bed). Memory Lane (Omoide Yokocho) for a tiny laneway of atmospheric restaurants that will only seat 6! Great yakitori! Visit a basement food court in one of Shinjuku’s massive department stores such as Keio or Isetan and be prepared to be astounded! 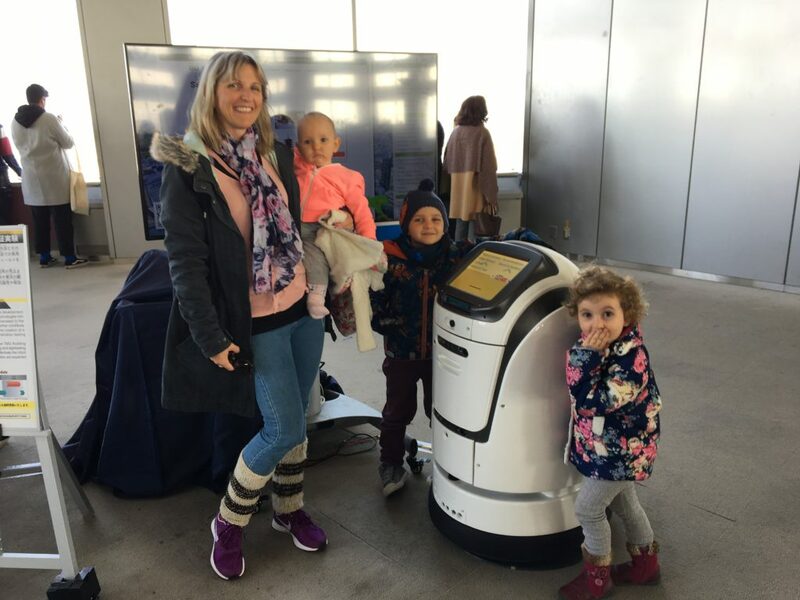 Tokyo is super stroller and wheelchair friendly. There are lifts and ramps galore and the street crossings are smooth as. We actually caught at taxi back to our apartment and decided to feed the kids something from the minimart that we could prepare at home. Catching a taxi was an interesting experience, we had to coordinate 2 taxis as there were 7 of us altogether (Mum came with us). So, as hard as it was to communicate where we needed to go with one driver, then he had to sort out a second driver too. Luckily I had the address written down in Hiragana (Japanese characters) so our driver knew where to take us! If you plan on catching a taxi, you need to have your address written down in Japanese or else you won’t be able to get where you want to go. Today we ventured out towards Harajuku and we needed to catch the subway. So, making sure we avoided the peak times and after a delicious breakfast of toasted pastries in our apartment, we head to our nearest train station. 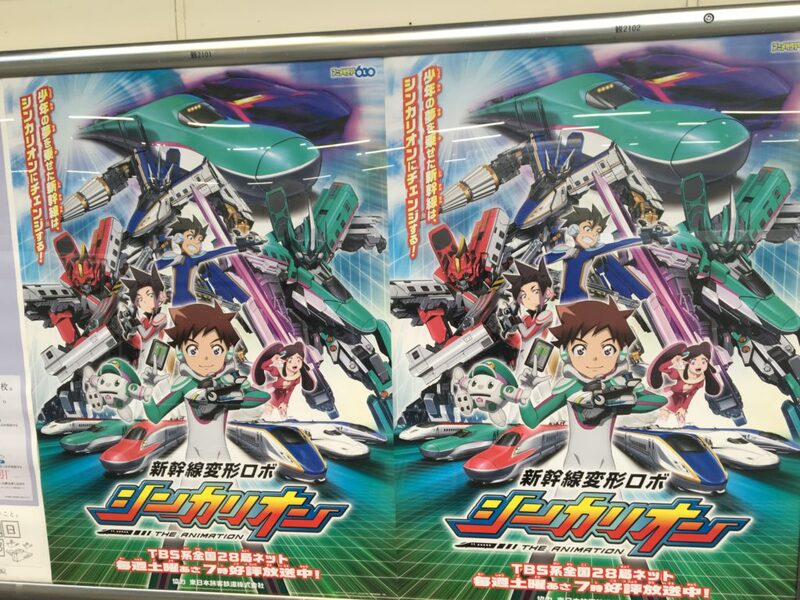 Tokyo peak times are 7am – 9am and 5pm – 7pm. When travelling around the city, please avoid these times, especially with kids, suitcases and strollers! You need a plan for train travel around the city and the best way to do this is to use the Hyperdia App on your phone. Download it before you leave home then check your route, there and back using your free wifi in your apartment or hotel, screen shot it for reference so you have it as you go. 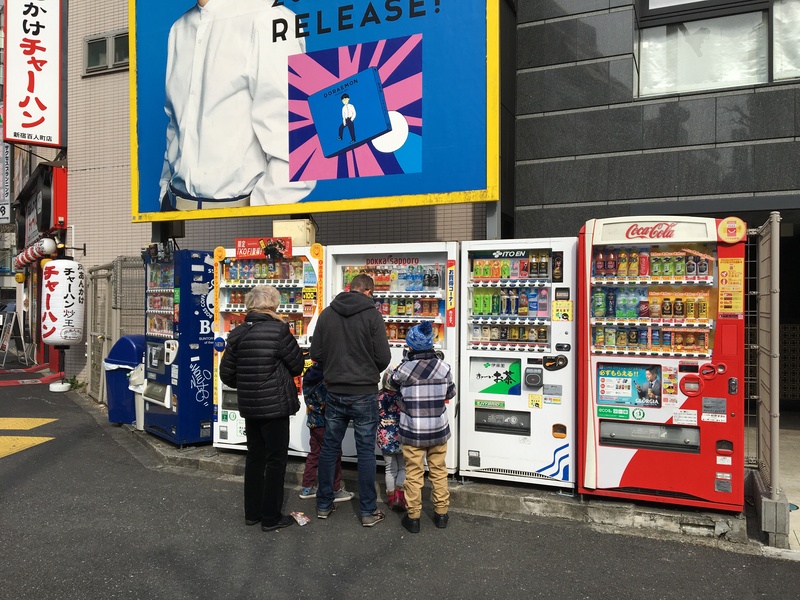 Next step, once you know where you are going is to get the Suica card to top up easily as you go at the machines in every station. They are simple to use and have an English language button. Then it is as easy as tapping in and out of train stations as you go and topping up when you need to. Get a Suica card to travel the subway. A themed cafe – these abound in Harajuku, choose from Monster Cafe, Cat Cafe, Owl Cafe, Alice in Wonderland, the list goes on. We decided on a Hedgehog Cafe and it was pretty special. Read about our visit here. Kiddieland is a really incredible multi-level toystore which has every toy your child never knew they wanted! We even saw Kim Kardashian shopping in there, so it must be good! 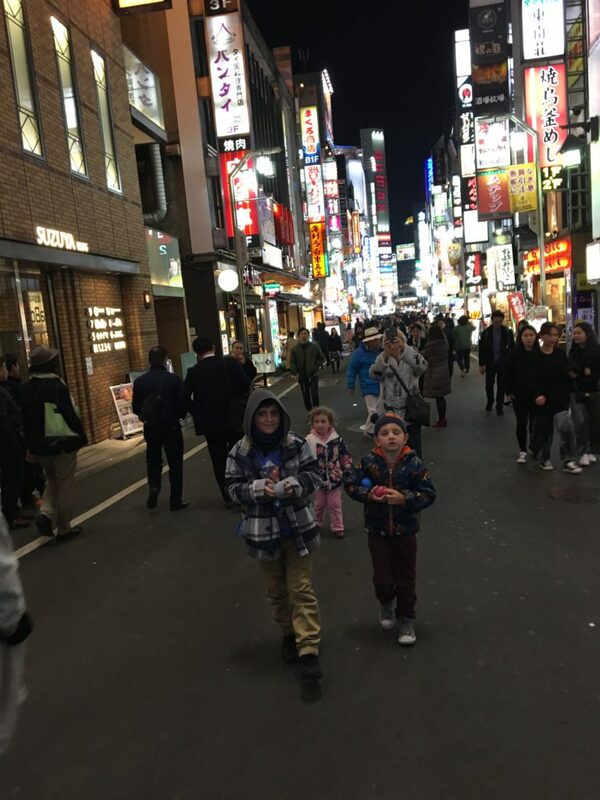 These are big days for the kids, especially all the excitement and the winter cold so we tried to be back in our apartment in time for them to have a rest before finding a local restaurant for dinner. Traveling with kids is all about the timing. Read more about the logistics of this here. The Miraikan National Museum for Emerging Science and Innovation for robots robots and robots! 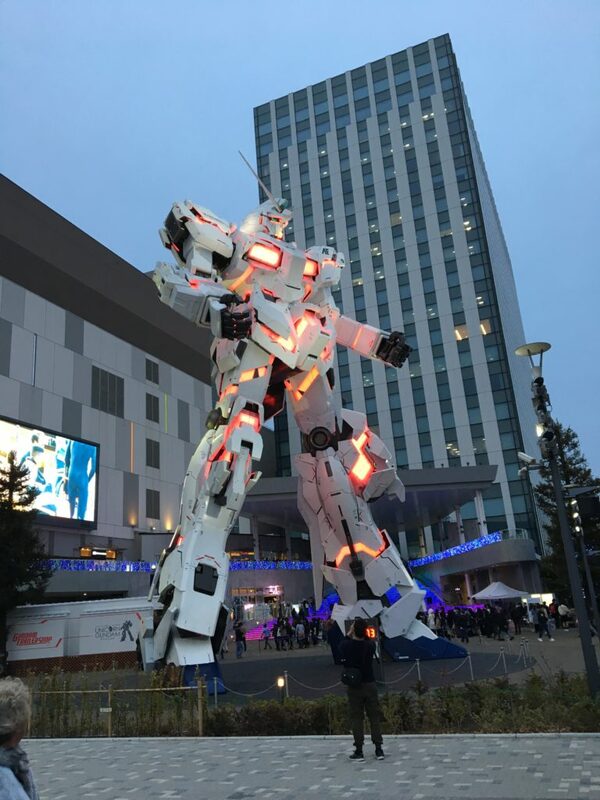 Diver City and the Giant Gundam Statue. It was like a trip to the future and seriously mind blowing and amazing. Read the blog here. This was the day we were supposed to go to Tokyo Disney. From Shinjuku there is a direct Disney shuttle bus and we were fully intending to go. However, it was a cold rainy day and I didn’t want the kids to remember the happiest place on earth being miserable queueing for hours in a wet Siberian breeze. So we didn’t end up going. Nobody minded. Instead we got to spend the day at Akihabara Electric town with a quick visit to Shibuya Crossing on the way past. Shibuya is the world’s busiest pedestrian crossing and it is a more modern city feel with lots of hustle and bustle, but still incredible politeness. 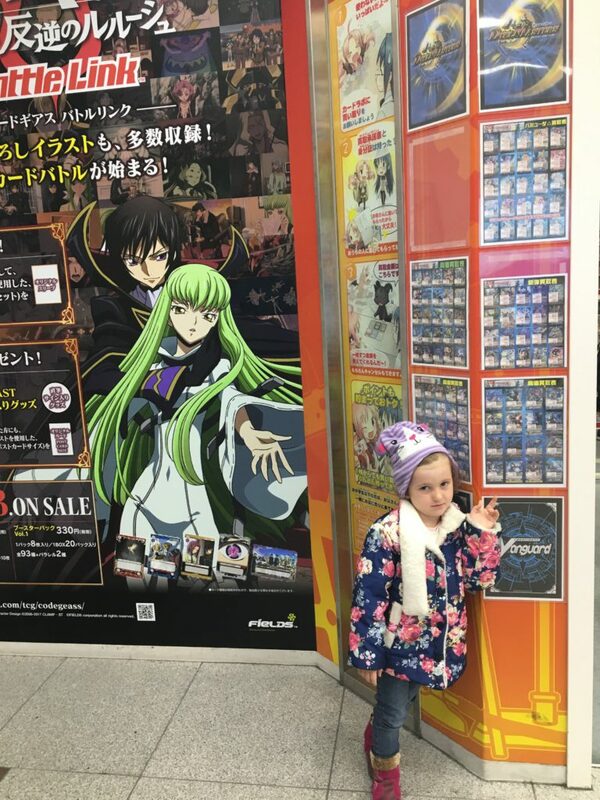 The kids loved Akihabara for the toy stores, and gimmicky electronics and appliance stores. There were doll stores which were for grown up Manga fans, whole floors of shops selling collector cards like Pokemon and others. 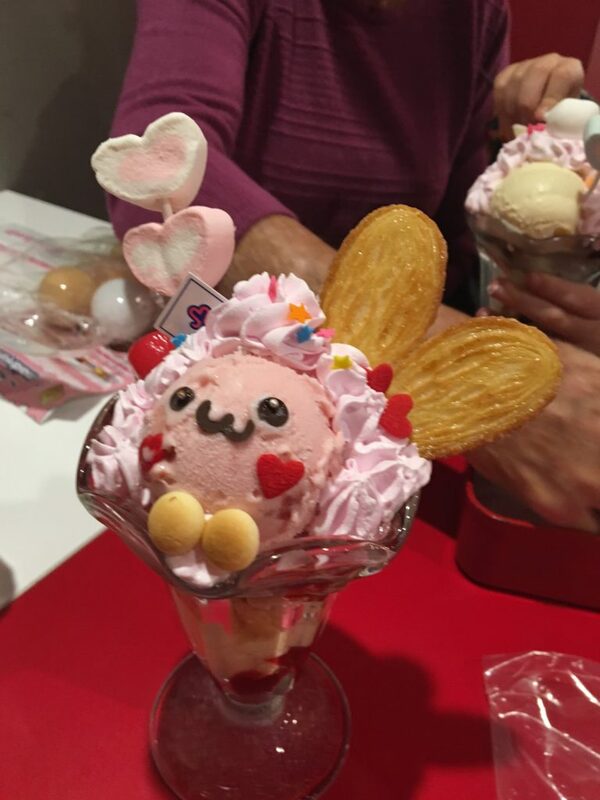 And we even paid a visit to a Maid Cafe which was an interesting experience to say the least. You will have to try it, and see for yourself, (but first read our blog about it here). The kids were very impressed with the (expensive) ice creams though! Before going to Tokyo, make a list of all the things you want to see while you are there. It is easy to get overwhelmed in such huge city that has so much going on. I recommend having a list of everything, and break it down into a must see or a maybe see if you’ve got time. Don’t overdo it, especially if you are bringing your family. Make sure you book popular Tokyo restaurants in advance online, do this before leaving home. I really wanted to go to a themed restaurant for dinner but found places such as the Ninja Restaurant were booked out for the whole time we were there as I only tried to book once we were actually in Tokyo. Make a plan and keep it fluid. Things can easily change such as the weather which will alter your plans. 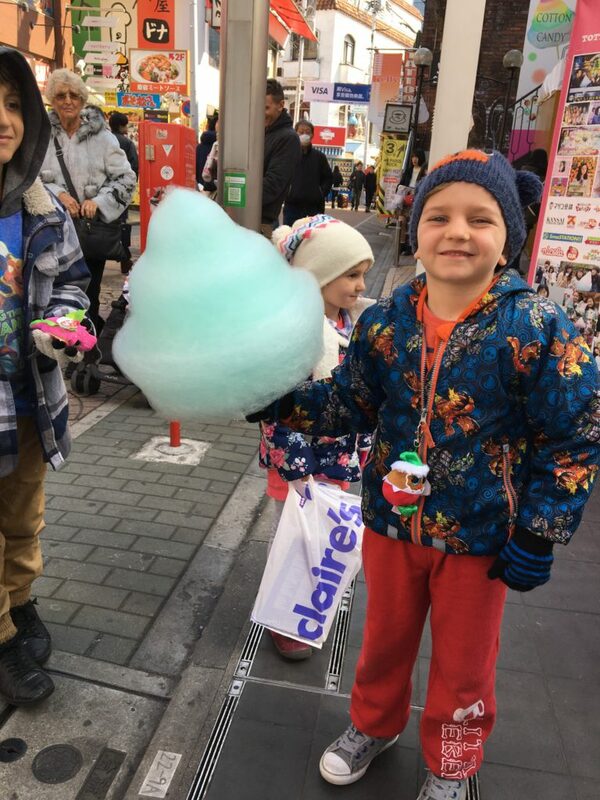 Stay tuned to find out what to do in Kyoto for 3 days, 5 days in Harajuku taking the kids to the snow and for some alternate itineraries for Japan coming up on the blog….